Editor's Note: At Thrillist, we know success takes a lot of different forms. Whether that’s achieving a personal goal, or turning a passion into paying the rent, everyone has obstacles to overcome. That’s why we’ve partnered with Sam Adams to create “The Driven.” Featuring men and women from all over the US who are a part of Sam Adams’ Brewing the American Dream program, we’re telling the stories of business owners who knew what they wanted and did everything they could to achieve it. These are their journeys. Five years ago, Cassandria Campbell noticed there were a lot of fast casual restaurants focused on quick, healthy, real food popping up in Boston. What she also noticed was that those places weren’t popping up in the low income and underserved neighborhoods where she grew up and lived. The options for on-the-go food in those neighborhoods were just fast food joints and corner stores. It was time for a change. 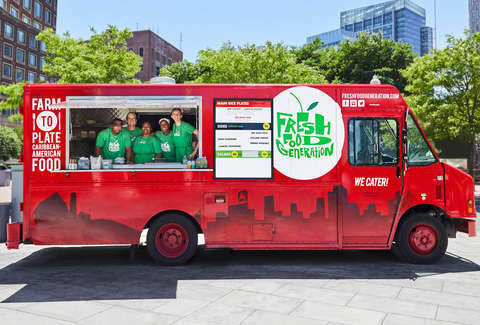 Campbell figured that food trucks, new to Boston at the time, would be a great way to get healthy, real food to everyone, no matter their zip code or income level. She approached Jackson Renshaw, a former colleague from The Food Project, a nonprofit that works to create personal and social change through sustainable agriculture, with her idea and asked him to be her partner. He immediately agreed. And so Fresh Food Generation was born. Campbell and Renshaw both started at The Food Project as teens, quickly realizing that it’s easiest to feed people when you can actually grow the food. Renshaw studied sustainable agriculture at the University of Vermont and worked on organic farms, but quickly realized that while the food he was helping to grow was being produced in a way that was beneficial and healthy for the land, the farmers, and the stewardship, it was going to high-dollar establishments, skipping over the people who lived nearby. Turns out: a little harder than they thought. Campbell and Renshaw knew their idea of a food truck that would address the geographic and economic barriers of food access was a good one. 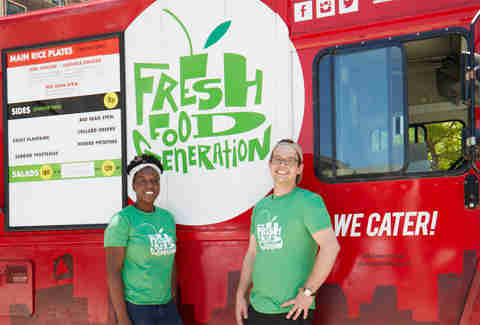 The challenge was convincing investors to take a chance on two 20-somethings who wanted to deliver farm-to-plate food in low-income neighborhoods. To overcome the lack of initial financial support, they entered pitch competitions, created a Kickstarter campaign, and applied for small loans. They managed to not just stay afloat, but expand. And along the way, they’ve also managed to find investors who believe in their work, so that they can continue to grow. Campbell and Renshaw raised $54,000 through their Kickstarter campaign, and, along with a loan through the Brewing The American Dream Program, were able to purchase equipment and build out their food truck that launched in Boston’s Roxbury neighborhood in 2015. 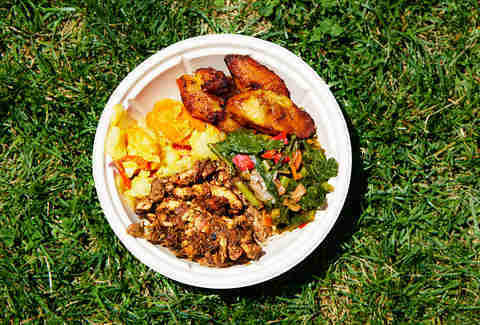 The truck, which concentrated on seasonal dishes inspired by Latin American and Caribbean cuisine, like jerk chicken and red bean stew quickly gained followers, and also presented them with opportunities to cater events for nonprofit organizations that care about community, health, and nutrition. Those relationships opened the door for them to start a café at the Dot House Health Center in Dorchester, which they took over from a vendor who was serving hot dogs, soda, and cake for breakfast. “Half of the building was excited about it, but the other half wanted to know why we stopped selling [soda],” Campbell says. Now, Campbell says, the kale salad is one of the cafe’s best sellers with the chipotle chicken quesadilla coming in at a close second. This isn’t just a huge win for Fresh Food Generation, however. It’s also meant a lot to the local farmers who sell them the produce they grow. Sutton Kiplinger, Regional Director of the Greater Boston Area at The Food Project, agrees. Campbell and Renshaw created Fresh Food Generation to help fix a broken food system. Now, with the help of some dedicated urban farmers, a team of passionate employees, and some really tasty jerk chicken, they’re well on their way to doing just that.